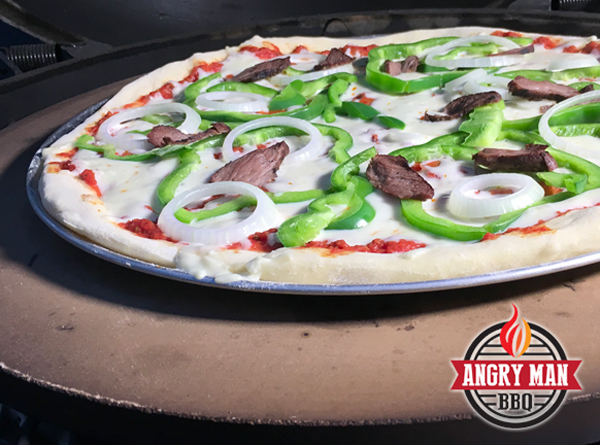 Our finished pizza from a recent evening at The Angry Man BBQ Test Kitchen on the shores of beautiful Lake Hartwell, GA. I try not to bore you to the point of anger with repetitious postings! However, we’ve been working a bit on pizza technique and an updated pizza post is really overdue. 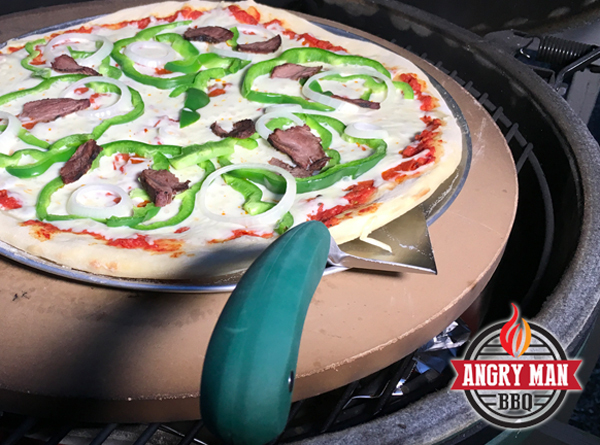 Here’s a quick look at how we’ve made a few changes to the set-up we’ve been using on the BGE to cook our pizzas. Keeping up with little parts like those plumbing “Ts” that I’d been using for pizza cooking is a pain in multiple body parts. Several folks have questioned cooking with the platesetter upside down. 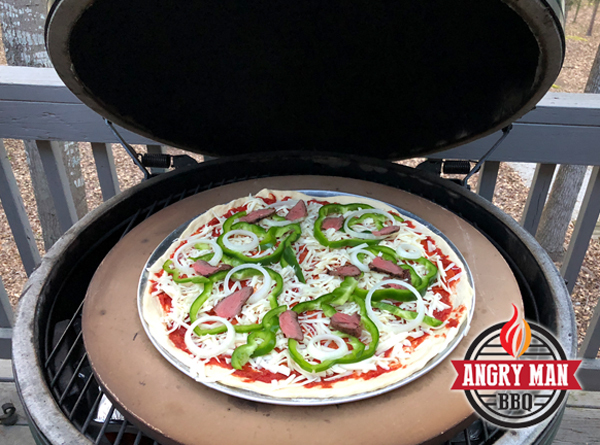 So I’ve been doing some research – slaving over a hot BGE just for the sake of providing you with a better way to cook pizza. Simple seems to always be better! I’ve just got to tell you up front: Quit what we’ve been doing!!! Just turn your platesetter (aka conveggtor for the newbies) with the feet up – put your regular cooking grid on top of the feet and then put the pizza stone on the grid. Do that – it works with nothing extra to purchase, store or find the next time you cook. Who knew it could be so easy? BGE dome temp for cooking is still 450°to 500°. Be sure to start you fire early and let everything get hot. I’d suggest you let it roll for at least 30 minutes once you’ve stabilized the temp. If you can let it sit for longer then that even better – we want that stone and all the egg ceramics to absorb as much heat as possible. Nothing changes in assembling the pie. You still need those pans that my father would have described as being “more holey than righteous”. 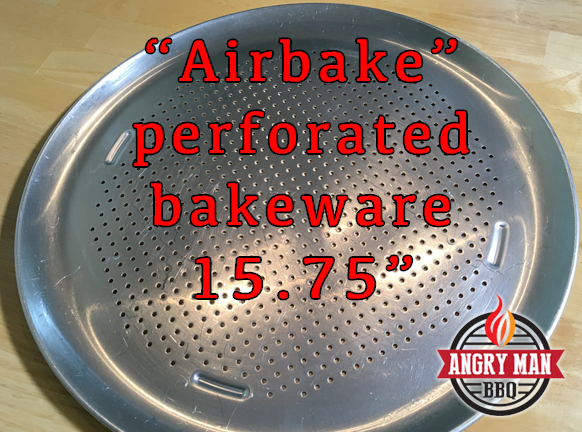 The Airbake pizza pans with all the holes are still essential in The Angry Man BBQ style of pizza baking. I lot of pizza joints cook their pies on a pizza screen – this is exactly the same but different. The “Airbake” brand pizza band is available at lots of department and cooking stores. Spray it with oil prior to use and build your pie with the dough on the pan. I stretch my dough (rolling the dough is OK if you can’t get it to stretch, but just don’t tell folks – have some pride). Place the dough on one of the holey pans that has been sprayed well with cooking oil. The Pleasant Lady and I like a well-topped pizza so we add our sauce, pepperonis, a layer of mozzarella, ground beef, sausage, peppers, left-over steak, onions and sometimes a light sprinkling of finely grated Parmigiano-Reggiano cheese to “ice the cake”. Start the pizza on the holey pan place directly on the platesetter. Dome temp is 450-500. 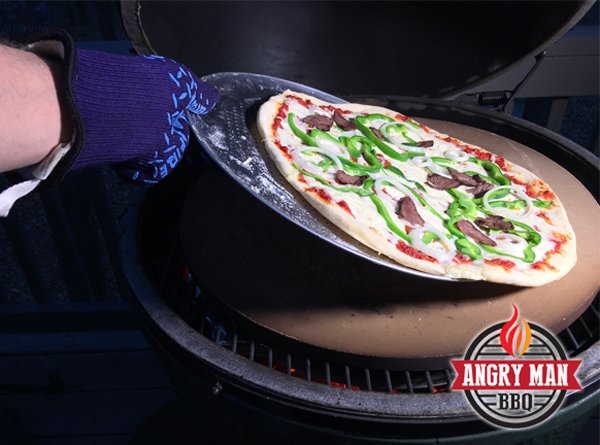 Place the pie – still on the holey pan – on the hot pizza stone and shut the BGE. Leave the pie for 5 minutes then reach in with a good glove and give the pan a 90 degree turn. We used pieces of left-over steak from the night before on this pie. Honestly, not many pizzerias offer filet mignon as a topping option! 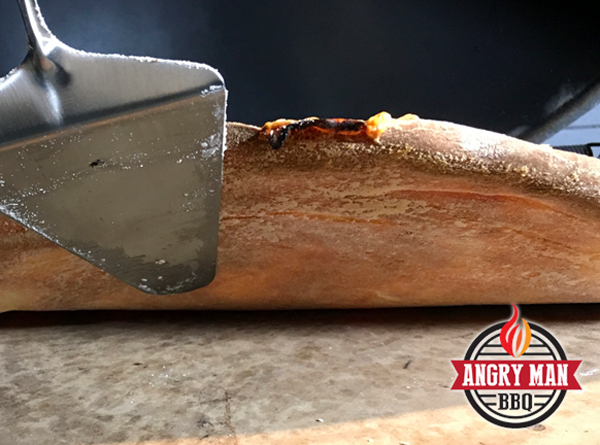 Then after another 3-5 minutes grab that pan and slide a pizza server (or metal spatula) under the edge to loosen the pie so that you can slide it right onto the stone. At 8-10 minutes in we slide the spatula under the edge of the pie and slide it around to loosen the pie so that it will slide off the pan. Just slide the pie off the pan and onto the cooking stone. The XL stone has plenty of room but be careful with a pie on the Large BGE stone since there’s limited space there. Good gloves are essential for this step. Close the BGE again and be patient – you may need up to another 10 minutes to get a beautifully browned pie. I’d check it at 5 and then keep an eye on it. Scoop it up onto the pan again to retrieve – or use that fancy peel if you want that super pizza chef feeling. Using this technique this pie cooked about 20 minutes total. The crust is crisp but not burned at all. The holey pan works much like the pizza screens many pizzerias use in their commercial ovens. Really – that’s our technique and it does work. Our pies tend to be well loaded and would never qualify as a truly thin Neapolitan style pizza that would cook at 900 in no more than 90 seconds. And if that describes your pie too then – well, don’t say I didn’t warn you that something bad might happen to your pie. Oh – and – just say NO to parchment paper – you don’t need it and actually, paper burns! All those unnecessary pics posted on the inter-web of burned pies on paper that’s burned too – no need for that. In closing this update I will offer up this one hint: When making pizza in the Large BGE I make the crust size just larger than the holey area of the pan. That assures that pie will fit on the large stone when I slide it off the pan. I love using the XL for pizza since the pie cooked on the XL stone can be the size of the entire pan. 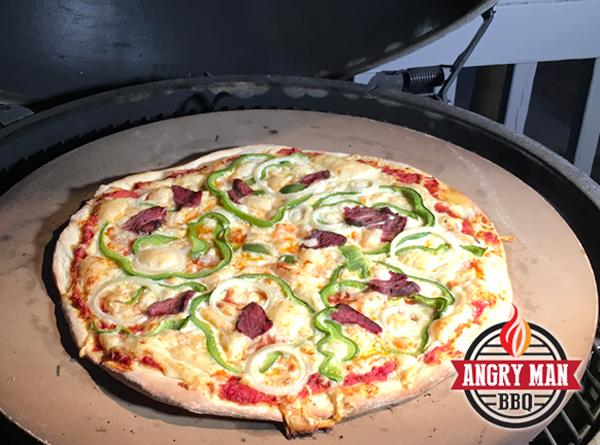 Pizza on the BGE is relatively easy cook that yields fantastic results. Just keep it simple and enjoy the process.